Previously in my post entitled http://myperspectiveis.blogspot.com/2011/04/westside-renaissance-in-deerfield-beach.html where I stated that in the last election that I supported Sylvia Poitier because after talking with the other candidates Ben, Gloria, and Annette I did not get a clear picture or any picture at all of what type of change they wanted beyond a change in Commissioner. With that said, in the time since the removal of Sylvia Poitier (April 14, 2011) I have chance to talk with each of the current candidates for D2 City Commissioner in the upcoming Special Election that will be held on July 19, 2011 and I must say that for the most part that Gloria and Andre Samuels have a great grasp of many of the issues facing the majority of the residents in this districts. I mention Andre and Gloria because in private conversation and now in their campaign literature they have expressed some core issues and have developed their own unique approaches to handling them. My last candidate profile was of Andre Samuels and I extended invitation to each candidate, so that everyone gets a chance to know them as I have gotten to know them. 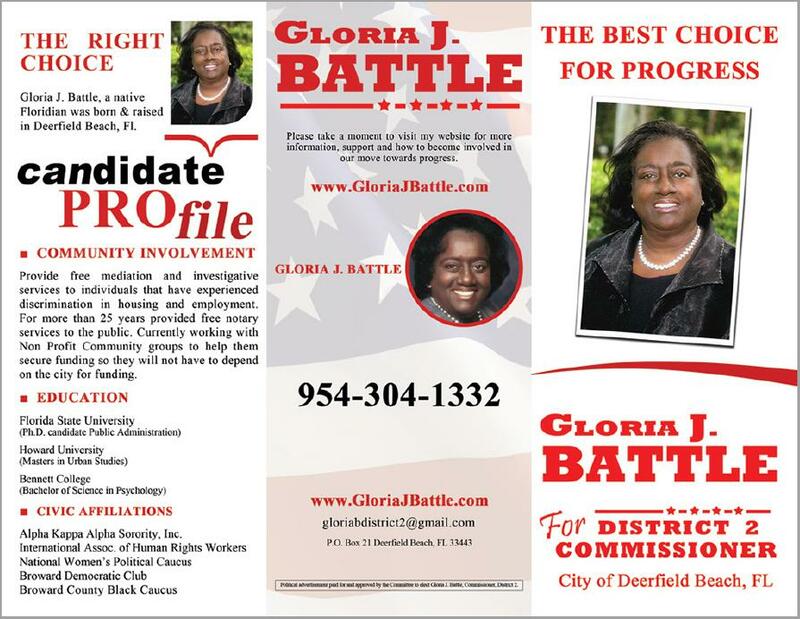 With that said, I would like to introduce you to Gloria Battle a familiar face on the Deerfield Beach political and non-political scene. I have known Gloria Battle my entire life and she has always been a fighter and, if I may add, one hell of a Spades player. We sometimes have not seen eye to eye, but I know that when it comes to District 2 and Deerfield Beach she does what she feels is in the best interest of all concerned. She will tell you herself that some may not like the way she may vote on this issue or that, but they can rest assured that she has done her research on the issue(s) and has considered all sides before making a decision. Gloria has clearly listed her views on the Utility Tax and Sports Volunteer Ordinance, which were imposed on the City's residents. 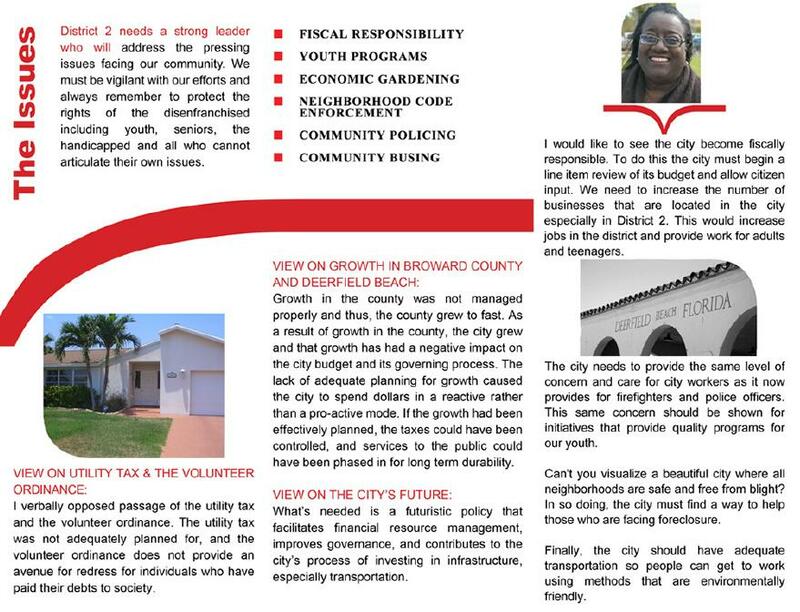 She has stated her view on the City's future and other topics of concern for all residents of Deerfield Beach. In this election she has also made it easy for concerned voters to find out information on her views, platforms, and opinions by visiting her website at www.GloriaJBattle.com, which I suggest everyone views. So, it would seem that at least two of the candidates, Gloria Battle and Andre Samuels, have clearly illustrated their views and plans on ushering in a new era in District 2 history, if either of them should win the Commission seat vacated by Sylvia Poitier. But the choice belongs to the residents of District 2 and hopefully everyone will come out and vote on July 19, 2011. We have some great choices, so I suggest that everyone read up on the candidates and on July 19, 2011 come out and cast an ballot for the candidate that you feel will best represent you as your Duly-Elected City Commissioner.